CURWOOD: It’s Living on Earth, I’m Steve Curwood. Gary Paul Nabhan is a pioneer in today’s local food movement. 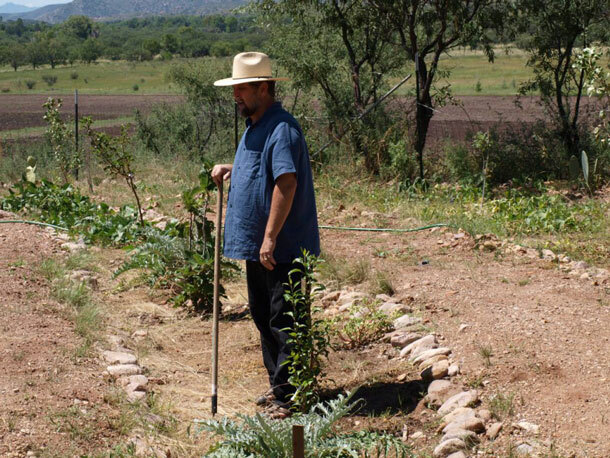 He is an agricultural ecologist at the University of Arizona and author of the new book Food from the Radical Center: Healing Our Land and Communities. Gary says digging our hands in the soil while collaborating across the current political divide can provide some of the best solutions to restoring not only the health of our lands, but also the health of our communities. Thank you for being with us today, Gary. NABHAN: Oh, it’s great to see you, Steve. Thank you. NABHAN: Well, I live in one of those rural communities, like many in America, where people are divided in terms of their political persuasions, almost 50/50 ethnic Hispanic and Anglo backgrounds. There’s also Native American and African American folks in our community. And people of different faiths, and we’ve all gotten along together, but the political divide has concerned most of us, and with these last elections it seemed like our country was divided 50/50. We can’t let the politicians solve that problem for us. We need to do it, and what I found over the last four years is that the way we bring people back together who have had adversarial relationships or felt that they were in conflict with one another is getting themselves out together on the land and doing work to heal the natural world, and by doing so, we begin to heal our social and ideological differences as well. NABHAN: Well, first of all, we know that nearly every faith has that tradition of bringing people together at the common table, not just to eat together, but to listen to one another. When those communities get together on the land, as I’ve done with Southern preachers and Northern ecological restorationists – and we go out and build terraces, and slow down erosion, and a plant number of native plants to hold the soil in place so that we can grow food on that land as well. We are getting beyond our ideologies and we’re seeing the talents, and observations, and skills, and even values of the people that we come together with in a way we couldn’t if we were just inside. NABHAN: I think a lot of times our concern with helping the poor overcome food security means that we focus exclusively on food banks, and soup kitchens, and not about the root causes of poverty. We have to remember that it’s not just space to grow plants for food that keep the poor from producing more of their food. It’s access to seed fertilizer, planting materials that are within an affordable range. And so that’s why there’s no single solution to the poverty that brings on food security, you really need an integrated approach. It’s not that people simply lack space. They may also lack time or access to seeds. And in Tucson where I’ve worked and lived for years, we now have 19 pre-seed libraries that distribute over 2,000 different kinds of seeds of edible plants to low-income residents just by going through the library and getting seed packets out of a library catalog box. And the interesting thing is 40 percent of those loans from the library are brought back with seeds back in the packets of people who want to share them with your neighbors. So, this is American democracy at work. Instead of paying now as much as $3 or $4 for 19 to 20 squash seeds in a packet at a health food store, people can get those same seeds for free through our libraries. NABHAN: I would have it a multi-strata garden with edible fruit trees and native trees with edible berries and nuts above the vegetable and herb plantings that people could utilize as well, and we need that to deal with the urban heat island effects and reduce the impact of climate change on poor urban neighborhoods that, over years, have lost many of their trees rather than having places where those trees can flourish. We also need to build into government and low-income housing space for gardens and community kitchens and orchards, rather than seeing those as amenities only for the wealthy, or externalities that couldn’t be worked into the budget of a housing project. CURWOOD: Indeed, if you’re low income, and maybe it’s because you don’t have a job or the greatest job, you’ve got a great incentive to go out there and grow your own food. It’s tax-free, among other things. CURWOOD: Your book plays out to be something of a reminder as to how beautiful nature is and was, and at the beginning of your chapters, you asked these memory-invoking questions that link to critical points that you’re making. So, why do you ask readers these questions, and what responses are you hoping to facilitate? NABHAN: Well, I wanted to make sure that readers knew that this effort is not about me, or about a few seed savers or tree planters that are lone heroes. It’s something that all of us have the capacity to do, that all of us who participated in stream restoration, or sewing of native grasses, or tree plantings enjoy and that everyone deserves credit. The community is the hero, not individuals who have made their names for being conservation superstars. The community is the appropriate base for long-term landscape restoration because this has to go on for more than one generation. True restoration of food producing landscapes has to start with the community rather than having community members as an afterthought. NABHAN: You know, I was talking about Camas lilies that day in the Pacific Northwest. And I thought I was just going out to learn a lot of technical knowledge about how to do restoration with fire and removing exotic species. And then these women that have formed a multicultural team to do Camas restoration brought me into 400-acre meadow just filled with thousands of Camas lilies blooming. And I remember that anything that we do should really bring back the beauty of the world, not just the nutritional value of the world or the biodiversity value of the world, that we’re inspired by that beauty, and it reminds us of the good work that many people have done in the days and years before us. So, beauty can’t be left out of this equation. 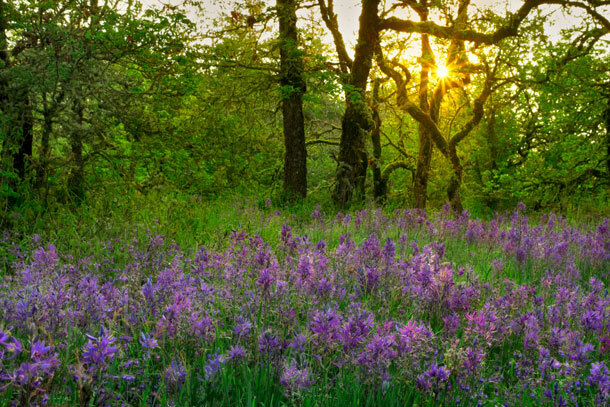 Camas Lilies are native to the United States and Canada. CURWOOD: Yeah, sometimes we’re so organized. I think of the Bluegrass Region in Kentucky. It’s called bluegrass, but you never see the grass blue because it’s only blue when it’s blooming, when it’s been allowed to kind of bolt and be free. NABHAN: Well, Steve, I’ve just spent a month on the Lebanon-Syria border in Syrian refugee camps, just a few miles from where my paternal grandfather emigrated from a century ago. And I saw the incredible heartbreak and suffering of a half-million Syrian refugee farm workers, mostly women there. And it, of course, gave me incredible empathy with them, empathy with what my grandfather and millions of Syrian refugees went through exactly a century ago. And I think we forget that our whole farming traditions and dietary traditions have been so enriched by what immigrants felt they had to carry with them. Seeds hemmed into their jackets and into their pockets so that they could carry what they loved in their former home into the United States to try to rebuild it. And it also reminds us that when many immigrants come to North America, they see its biodiversity and soil fertility, and access to water. Unbelievable compared to some of the conditions that they came from, and they want to help take better care of it. And my grandfather was one of those. He had to abandon his family orchard as he left the Ottoman War in in Syria, but as soon as he could start planting trees and selling fruit again, it was inimicable to his own identity, so central to him, and he literally taught all his grandchildren how to taste fruit in a way we just don’t get to learn anymore just picking it up at a Quik Mart. Remembering that food is one of the last things that we leave as part of our cultural identities. We may lose our grandparents’ languages, or their way of doing business, but the food traditions carry with us much longer. NABHAN: Well, I remember my grandfather having me smell a melon, cantaloupe, and feel the ridges on it to know when it was ripe. He said, the ridging, the veining, the netting on a cantaloupe will pop up and tell you when it’s ready to be eaten, and then you smell its belly button, and that tells you how sweet it is, and whether it’s ready to eat. And he did similar little exercises with me with figs, and pomegranates, and other fruits that he knew in the old world. One of the things that my grandfather reminded me of was that, if we choose to find out when food is at its ripest, even though it may look bruised, and use it for its value at that time, we reduce food waste, and food waste is now 40 to 50 percent of everything harvested in American fields. And half of that happens after the grocery store, at the household level. So, knowing when our food is ripe and when it’s ready to spoil and paying attention to it as it fully ripens, so that we can use it at the exact time is really helping reduce greenhouse gas emissions and the loss of perfectly edible food in a world where a large portion of the population is still food insecure. CURWOOD: Oh my, Gary, you have me thinking of the summer, and here it is in the winter, and it was 20 something this morning where I am in the northern part of the US. You had me thinking of a peach so ripe that it’s running down my hand, my arm as I try to get it up to my mouth, almost overripe, almost ready for the dustbin, but oh my, so delicious. NABHAN: You know, and I think that’s a key point that the sensuality of eating good food and the sensuality of working on the land, gardening is one of the most sensory rich pleasures that I engage in, are delights beyond words that apricots bite the drips down your chin as a burst forth with flavor and juices is a great pleasure to many people from the first time they eat an apricot. And food is not just about calories or cures. It’s really about our deepest connections to the earth that we live on. CURWOOD: One of Gary Paul Nabhan’s books for 2018 is “Food from the Radical Center: Healing Our Land and Communities”. Thanks for taking the time with us today, Gary.